The figure known as the “Man in the Maze,” depicts a man entering or exiting a labyrinth. It is a theme seen on baskets from as far back as the nineteenth century and in Hopi silver art. Such depictions of labyrinths are also found in ancient petroglyphs (Native American rock art). The symbol can represent a person’s journey through life. The maze contains many twists and turns, meant to represent choices made in life. The center is round and dark, so the journey can be from darkness to light or vice versa depending on which way you are headed! Some interpret the center as a representation of a person’s dreams and goals. When you reach the center, you have reached your goals and the sun god there blesses you and helps you pass into the next world. 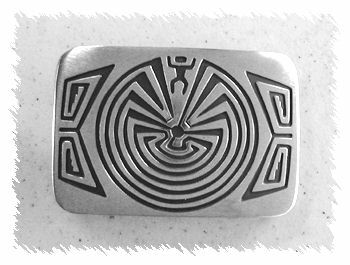 Hopi Man in the Maze items range from bracelets to belt buckles to earrings and more. They are characterized by a cutout overlay of the pattern with a dark oxidized background that traditionally is textured with hashmarks. Navajo artists make Hopi style overlay pieces with the main difference being that the background is oxidized but not texturized.